The Nike Women’s Air Embellish Golf Shoes are tour-tested and are customizable with interchangeable saddle straps. The shoes come with different color saddle straps to create four different looks of purple, fuchsia, black checkered and silver. What I love about these shoes is that I can customize them myself and add color swatches that match my outfit. Think Ricky Fowler and his matching outfits, but you can have shoes with the same print as your skirt. At the moment I’ll have to get crafty with this venture, but hopefully Nike will get smart and start producing more color swatches to sell to its consumers. Me Wearing them on the Driving Range! They are oh so comfortable. I didn’t even have to break them in. 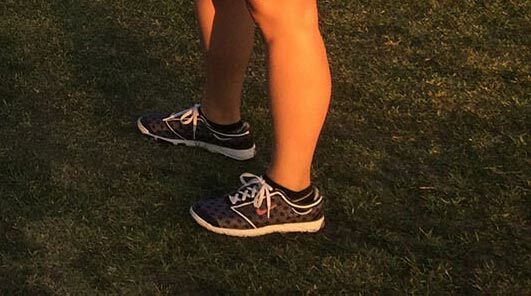 I remember back in the beginning of my golf career having to doctor my feet after every round because of all of the blisters that would form, but with these shoes my feet were in heaven.